I'm SO late to the game on this. But I'm going to post it anyway. Put on your matching hat, slip under the muffin top of your Cupcake Car, and let the world figure itself out for awhile. Get (or give) the sheer, joyful chaos of a gift that is mind-blowing, triple-dog-dare, double-infinity forever cool. Make the kids or grandkids literally squeal with joy. Bring it to work and buzz the breakroom. Crash parades! Putter about the ‘hood. Ever had a crowd of kids chasing after you just for the crazy gleeful heck of it? (No worries, the top speed is a comfy-safe 7 mph.) What’s it made of? A 24-volt electric motor, a heavy-duty battery, sheet metal, wire, fabric, wood…and mad genius. 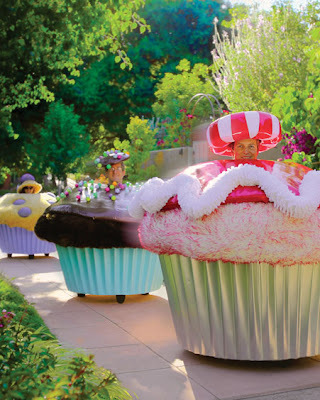 Launched at Burning ManSM as a cooperative art car project, the Cupcake Car sprang from the fevered mind of Bay Area artist Lisa Pongrace and her less-rules-more-laughs posse of artists and techno geeks. Yours will be tricked out with your favorite topping, so start thinking flavors.